I ordered a box of Moo Cards the other week. I think they’re spiffy. I also ordered a shiny matte new camera, too (Leica D-Lux 3). 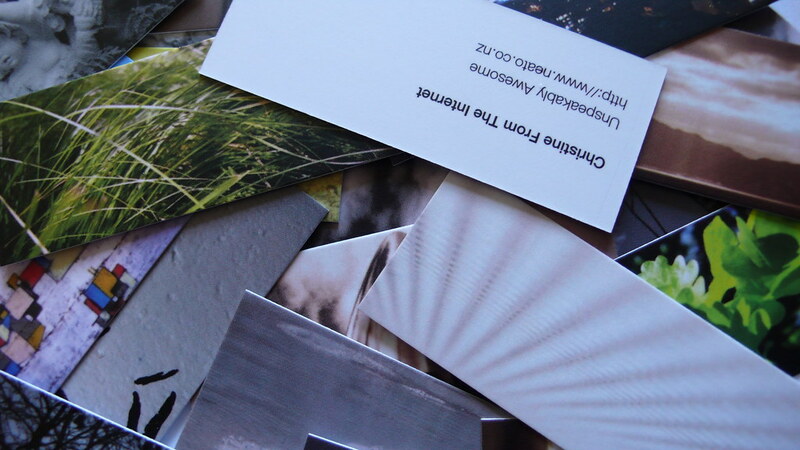 Behold it’s photographic glory in the above; where you can see in all their glorious details, the ink droplets on the fronts of the moo cards. Posted on November 9, 2007 by Christine D.	This entry was posted in Photography and tagged moo-cards. Bookmark the permalink. ← UTW in Themes + WordPress 2.3 A Go-Go. Those are so cool. Is that the one associated with Flickr? Thanks for this. Will try it. Flickr is one of the sites you can conveniently import photos from (It’s what I used for mine, at least). You can also upload directly, or there are another half dozen other places where it can pick images up from.